Mmmmmkay. Here goes – sorry some of the photos are blurry, it’s just me and my 2.1 mp camera round here! Consider this my contribution to Socktoberfest! Photo heavy post, of course. Click photos to embiggen. This is the method I use on my short-row heels. 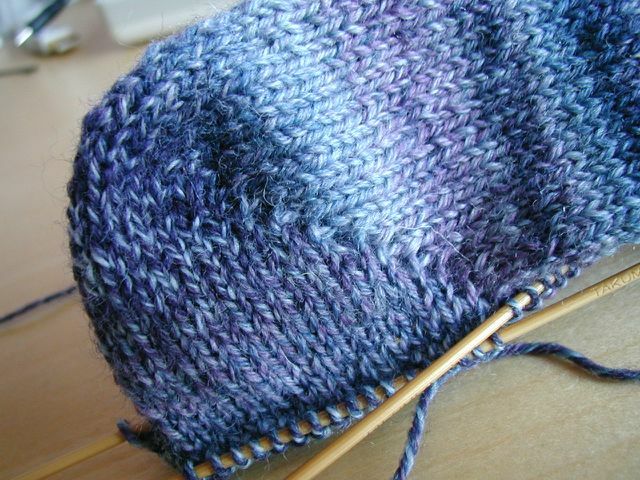 These days I do the short-row heel almost exclusively; I just find it so darn fast and easy. No counting (well, minimal counting) and no increase in stitch number. Plus, it fits me well – your mileage may vary. 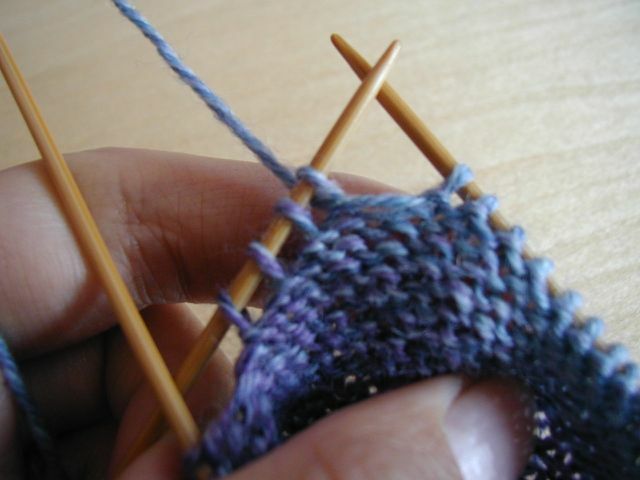 And yes, this does involve knitting and purling three things together. 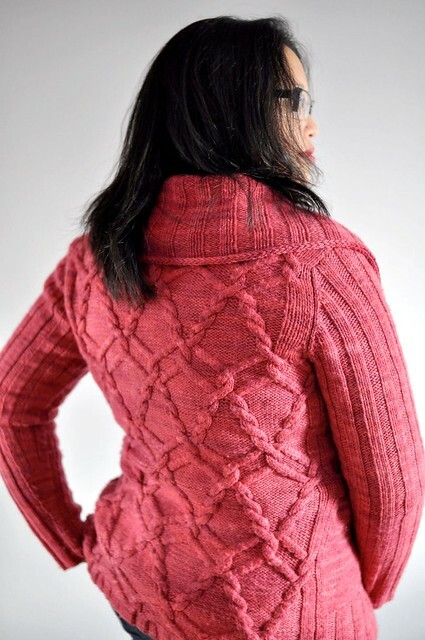 I knit quite loosely; this might help me do those more easily than someone who knits tighter. Bring the yarn to the front. 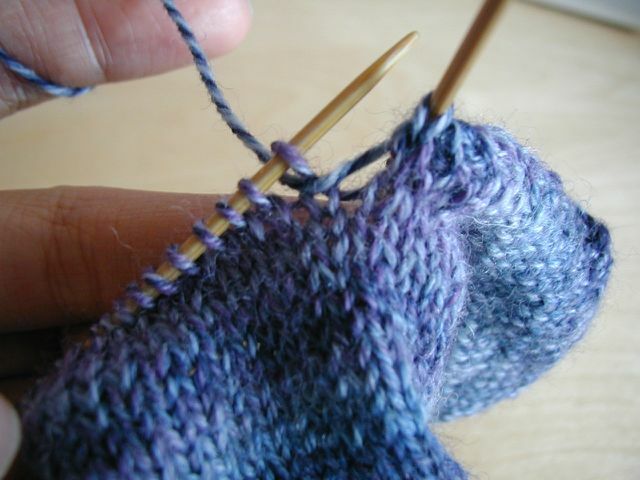 Slip the stitch purlwise. 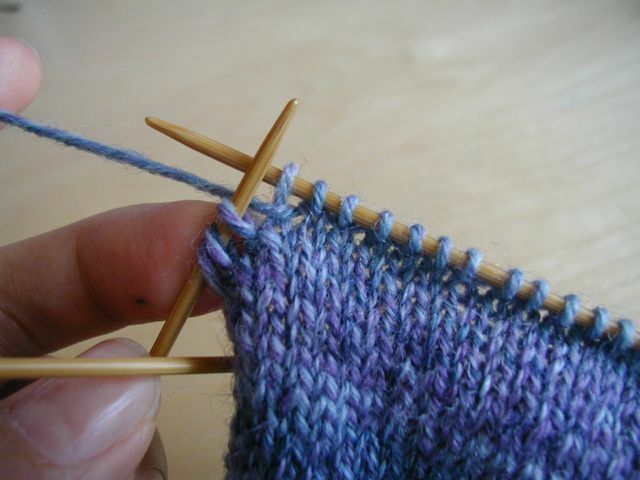 Bring the yarn to the back and put the just-slipped stitch back onto the left needle. 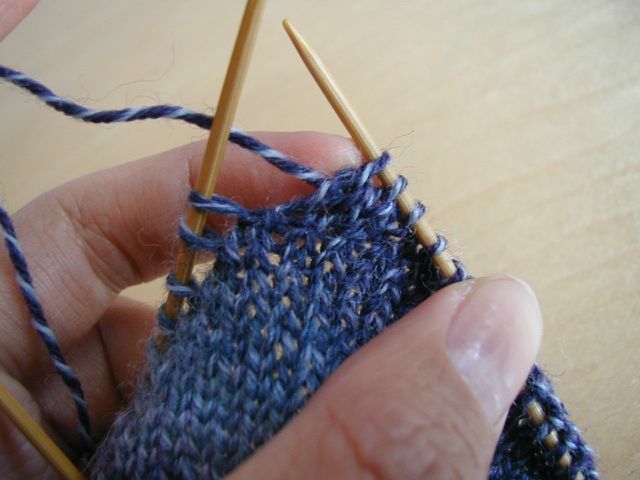 When you turn, your yarn will already be in the correct place to start purling. 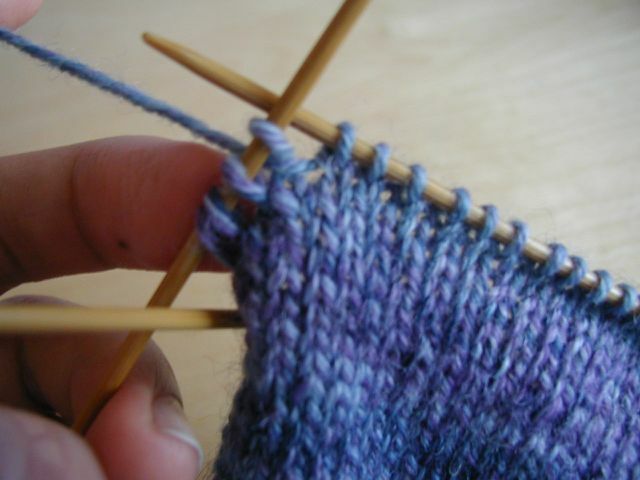 Purl across to the last heel stitch. 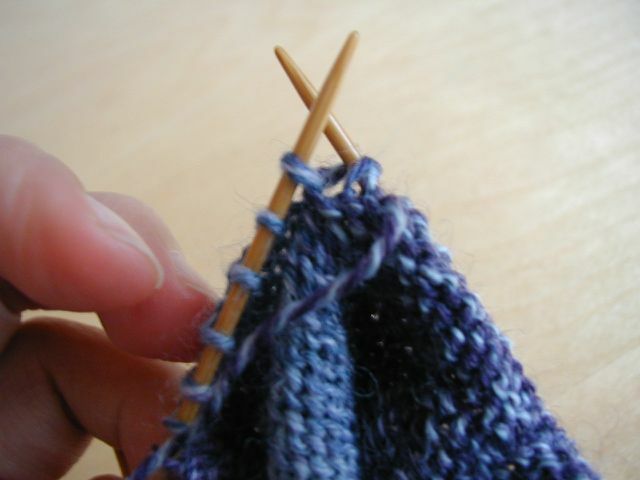 Keeping the yarn in front, slip the stitch purlwise. 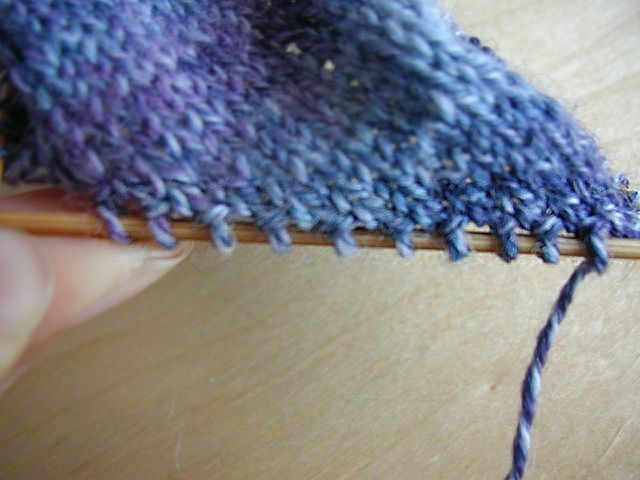 Bring the yarn to the back and replace the slipped stitch on the left needle. When you turn, the yarn will be in the front. Bring it to the back between the needles to start knitting. 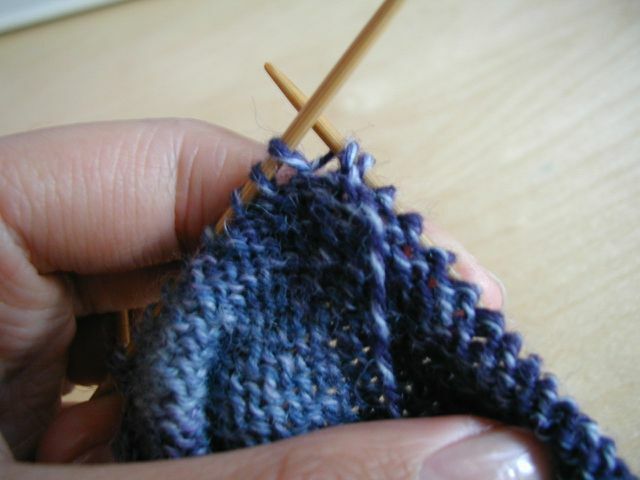 Knit across to one before the previously wrapped stitch, wrap, and turn. 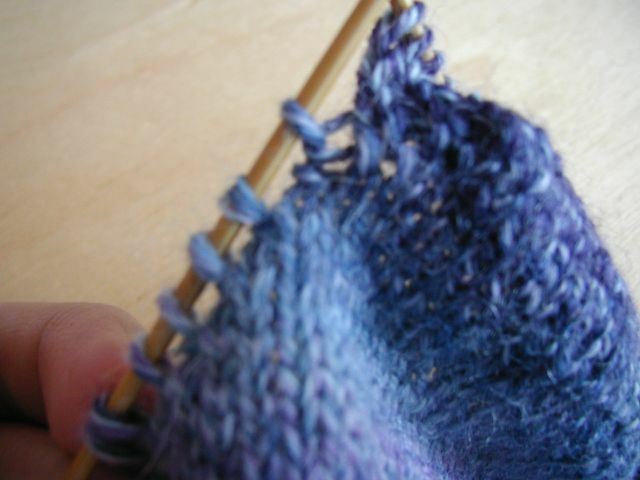 Purl across to one before the previously wrapped stitch, wrap, and turn. 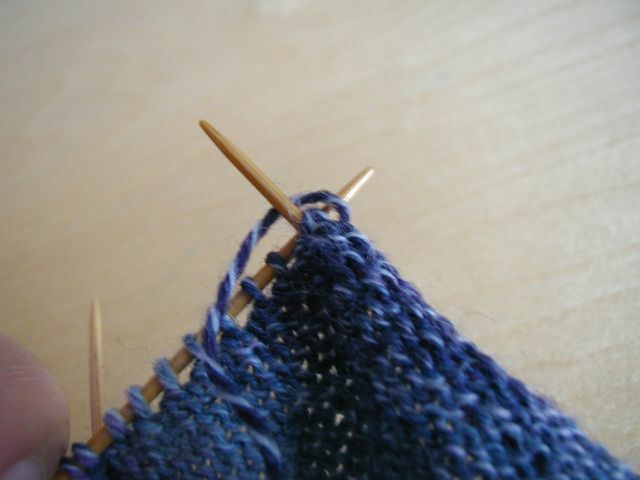 Continue to work back and forth, wrapping and turning one stitch before the previous wrap on each end. I go until I have 14 stitches remaining unwrapped in the middle. Now the tricky part – picking up the wraps! 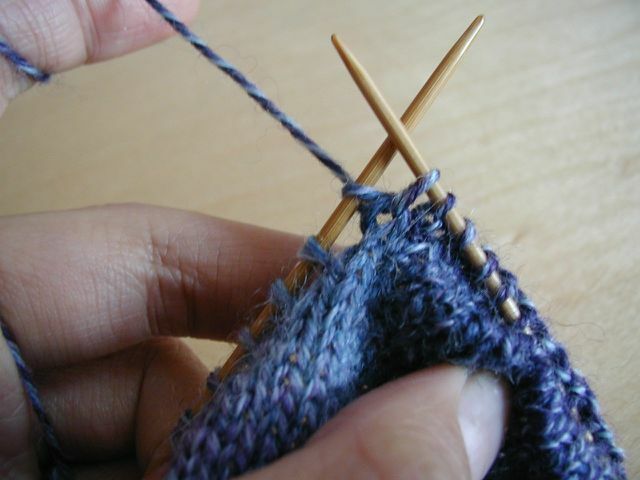 Knit across to the first wrapped stitch – this one is only wrapped once. 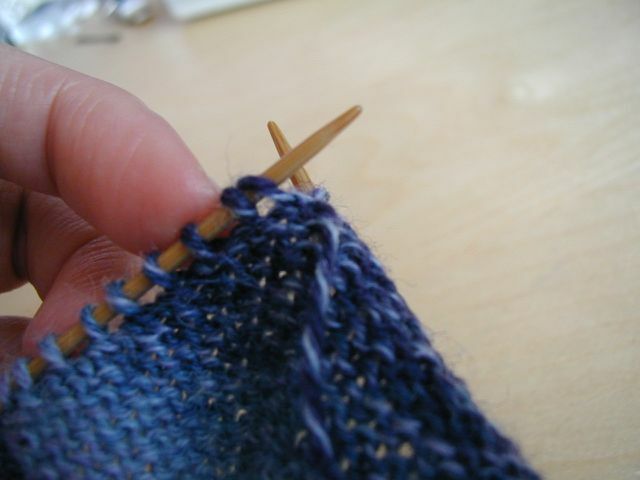 Insert the right needle tip into the wrap from bottom to top, and then into the stitch. 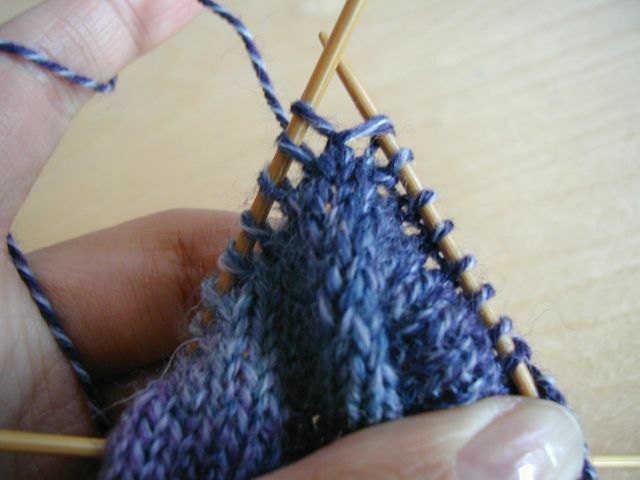 Knit the two together by wrapping the yarn, then bringing the new stitch through the old stitch and then the wrap. Wrap the next stitch (this next stitch now has two wraps) and turn. 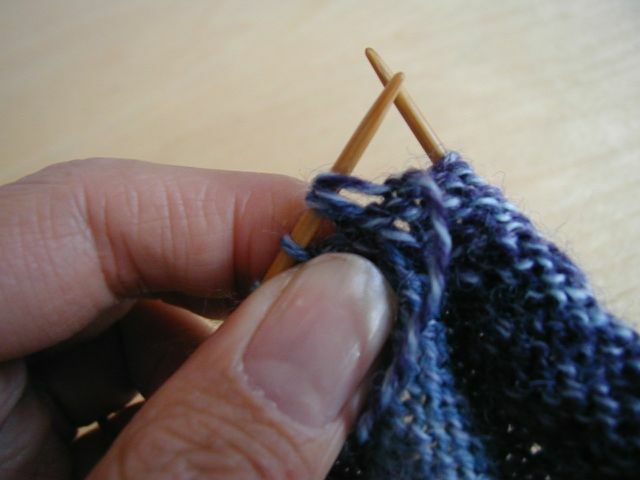 Purl across to the first wrapped stitch – this stitch has one wrap. See the row of bumps? Those are the wraps, and they need to be picked up on the public side in order to become invisible. Pick up the wrap on the right side of the work, from bottom to top. 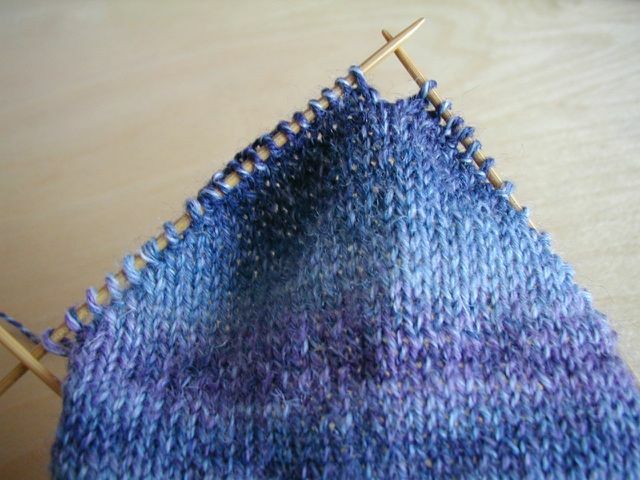 Place this wrap on the needle. Purl these two together. Wrap the next stitch and turn. 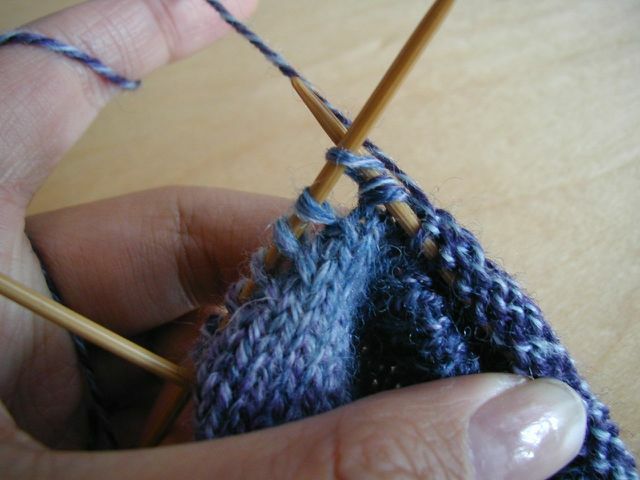 Knit to the first double-wrapped stitch. You’ll need to pick up both wraps. 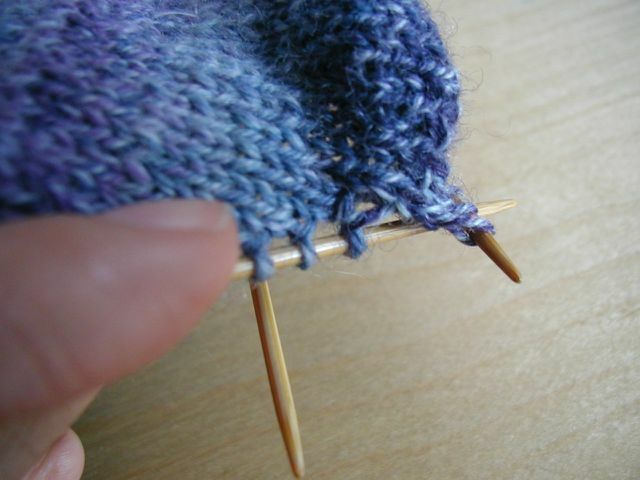 Place the right needle tip up through both wraps from bottom to top, then into the stitch. Wrap the next stitch and turn. 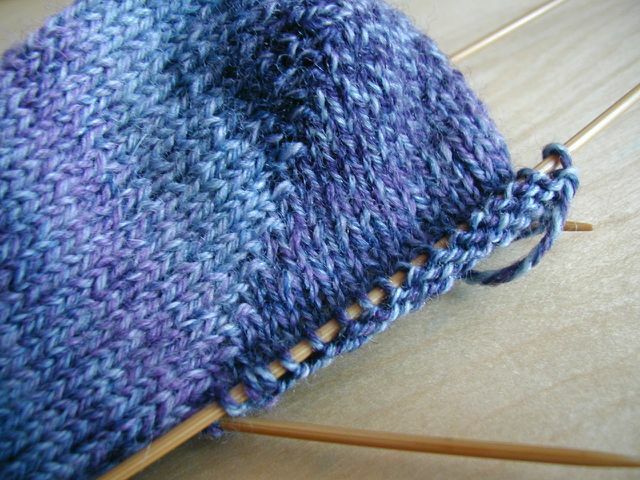 Purl to the first double wrapped stitch – here’s a photo of the two wraps, from the right side. Pick up both wraps from the right side, from bottom to top. Place them on the needle and purl the three together. Wrap the next stitch and turn. 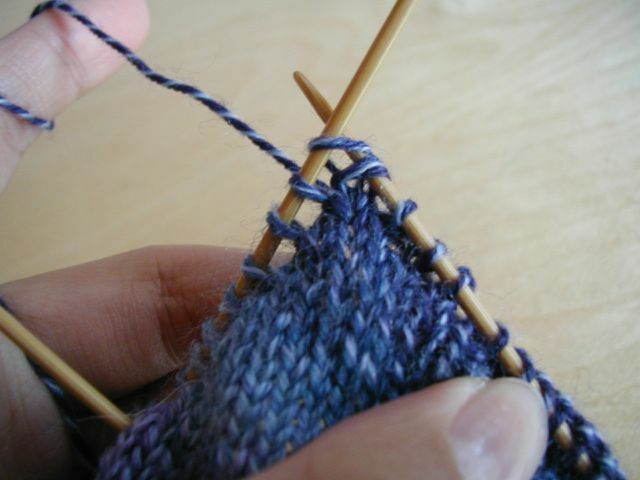 Continue to work back and forth, picking up the double wraps and wrapping the following stitch. 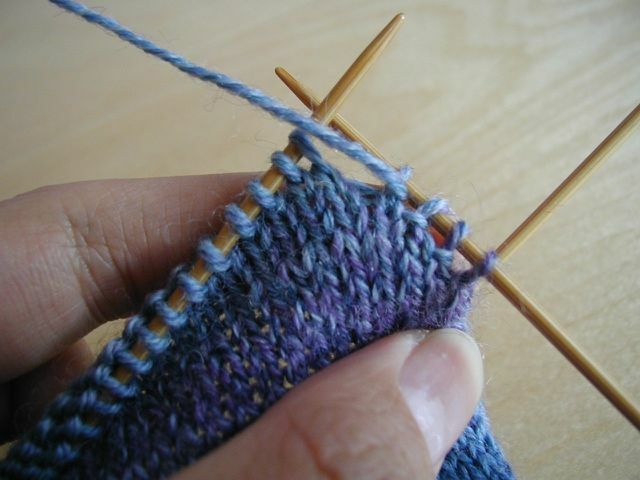 When picking up the wraps on the last heel stitch, I like to wrap the following (non-heel) stitch to prevent a hole from forming there. 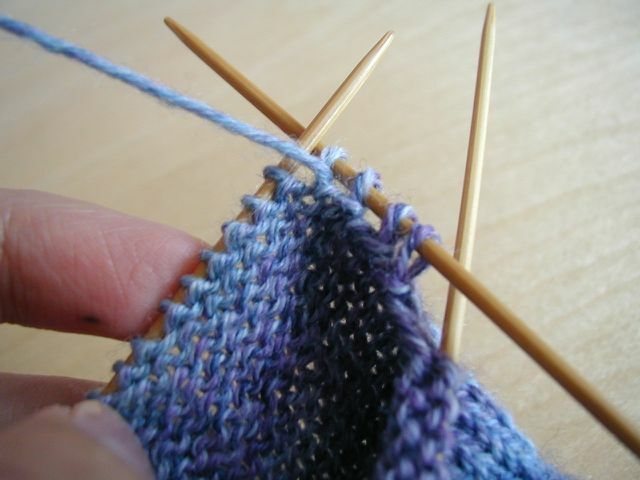 When you turn and purl across, pick up the wraps on the last purl stitch and then wrap the following stitch. Turn and work all the way around the round, picking up each of these two wraps on your way. My method’s pretty similar to that of misocrafty, so you might want to check that tutorial out too!